I love sweet potatoes. I think they are great in soups, casseroles, steamed, baked and even sauteed. And who doesn't love sweet potato fries?! (They are hardly healthy, but oh so delicious.) Recently I discovered the most delicious sweet potatoes I have ever had. Seriously. I can't get enough of them. I'm not sure if it's because they are organic or if they are simply a different variety, but they are fabulous and I will never buy conventional sweet potatoes again. 1. The fewer chemicals, pesticides, fungicides, herbicides, and other "cides" I willingly put into my body the better (just living on this earth I am already ingesting plenty that I don't know about). 2. I don't at all like the idea of eating genetically modified organisms  (GMOs). Most corn in this country, whether being fed to the cows or to your kids, has been genetically altered. Scientists have yet to conclude what this is doing to our bodies. But I figure the closer to "natural" the better. Organic food just tastes better. 3.The flavors are more full and well rounded. Sweet potatoes are more sweet, blueberries are more tart, and tomatoes are delicious. There are plenty more reasons to stick with organic produce, meat, and dairy products, but these 3 reasons are enough for me to stick to organic whenever possible! Not too mention that in the nutrition world it is believed that you get more vitamins in nutrients from organic than conventional products. So buy organic and no longer be afraid to eat the skin of your apples. If you can't buy everything organic, there is a list, known as the DIRTY DOZEN, of fruits and veggies that are important to buy organic. I am sure you can guess why they are called the dirty dozen--they are either the most susceptable to chemicals, absorbing every drop in their skin and flesh, or they are farmied using very high amounts of chemicals. 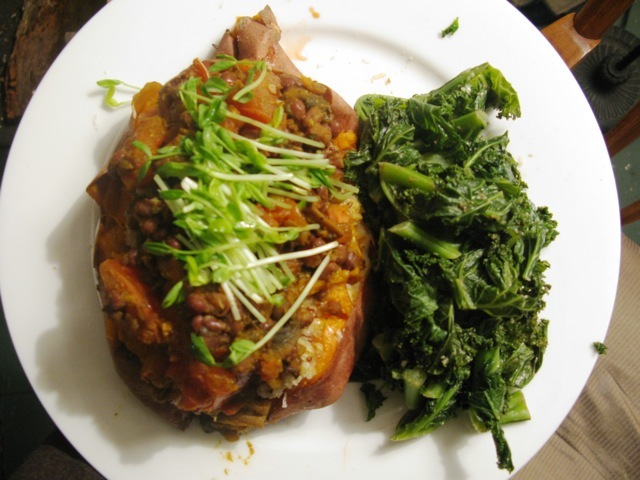 Buy yourself some organic sweet potatoes and try out this recipe today... or save it for a tasty Meatless Monday dinner. Preheat oven to 375 degrees. Pierce the skin of the sweet potatoes and put in a casserole dish. Place in the preheated oven and bake for 45 minutes to 1 hour, or until the potatoes are cooked through. Meanwhile, dice all of your veggies. Sautee the onion and garlic in the coconut oil over medium-high until the onion is transparent. Add the mushrooms and a splash of water. Sautee for 5 more minutes. Add the carrots, bell pepper, curry powder and salt, to taste, and sauté for 5-7 minutes. Add the beans and tomato and heat through. Taste and adjust seasoning as desired. Turn off the heat, cover, and keep warm until the potatoes are ready. In a large pot, steam the kale until it is dark green in color. This should not take very long at all. Be careful not to overcook this delicate vegetable. Strain and sprinkle with nutritional yeast, a pinch of salt, and parmesan cheese. Stuff the potatoes. Remove the potatoes from the oven and make 3 slices, lengthwise. Stuff some mozzarella cheese in the slits and close the potato back up, allowing the cheese to melt. Next, pile some of the cooked quinoa on top of the potato and grate some parmesan cheese on top. Finally, put a scoop of the sauté on top and top that with the sprouts. Serve with the steamed kale.